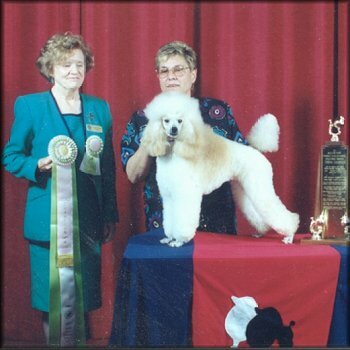 Annabelle lived to the best possible way, the first young years of her life she was shown to her Championship, then had some babies which she loved dearly, then Jamie Bonamo and his wife came along and wanted an slightly older dog. It was hard for me to give Annabelle up, but I knew she would have a great home with the Bonamo's. She went for walks and sometimes to work with Jamie. I was doing obedience with Annabelle and she was a natural at it. She is sadly missed by the Jaime & Sande Bonomo and Burdick's.